It’s been another busy day at the Devon County Show as the crowds flocked to enjoy the very best of Devon food and drink, spectacular action in the main arena and see prize winning livestock. It was also another royal day at Westpoint with a second visit from HRH the Countess of Wessex, who is this year’s President of the Devon County Agricultural Association which stages the Show. She visited one of the Show’s star attractions, Devon Remembers, a tribute to those who died in the First World War and made from poppies crafted by local people. As she left she was presented with gifts by Sophie Moore aged 11, George Morrison, aged nine and Charlie Moore who’s eight. They were responsible for counting the 33,000 poppies as they came in. Summing up day two of Show Secretary Ollie Allen said it had another really good day. “Thankfully the showers have passed largely passed by and the showground has stood up really well to the rain we have had,’ she said. Meanwhile monster trucks Big Pete and the Grim Reaper wowed the crowds in the main arena with their spectacular car crushing routine. They’ll be performing again at the Show today (Sat). Today was champions’ day with a clean sweep for Devonshire in the blue riband of the Show's livestock classes, the interbreed cattle championships. Michael and Melanie Alford, of Foxhill Farm, near Cullompton, carried off yet another top prize at a major show, as their two year old in-calf Limousin heifer, Corranhill Krystal, took the interbreed championship for beef cattle. Led by their daughter, Charlotte, the Irish-bred heifer was described by judge Richard Harvey as "full of flesh and a superb example of the breed". The reserve beef champion was Waddeton Hilda 78, an eight year old South Devon cow, bred and shown by renowned South Devon breeder, Gordon Tully, of Waddeton Barton near Brixham. "She's still looking a picture, despite having had seven calves already including two sets of twins", said Richard Harvey. The Holsteins took the dairy interbreed, in the shape of five year old Curscombe Windbrook Joy 89, bred by Mrs Jenny Bishop of Feniton in East Devon, and shown by her daughter Nicola Lockyer. 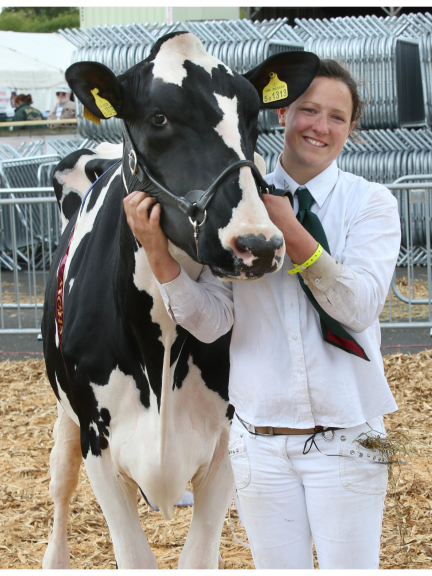 The cow was reserve champion at last year's Royal Cornwall Show, and is currently giving up to 56 litres a day. "She's certainly one of the best cows we have ever bred", said Mrs Bishop. And, in a ringing endorsement of the decisions made by the judges in the Devon Farm Business Awards, both the champion and reserve were entered by former winners - Nicola Lockyer having been named Woman Farmer of the Year in 2015, and the Davis family winning Devon Farmers of the Year for 2016. Among equestrian winners was Bloomfield Excelsior which took the Ridden Hunter owned by Shades of Grey Syndicate. Sheep interbreed judge John Jordan won top honours for the Dartmoor Ponies In Hand competition with Moortown Crusader. Owner Rosemary Dickens not only took the Hunter Breeding Filly but she also took the Sports Horse, which was produced by Charles Upham and Mrs Steve Davey. Children go free to the show on Saturday. Two children aged 5 – 15 are admitted free per adult and children under five are free.